Adding skylights to your home is one of the most practical investments to make when you consider all their potential benefits. Better views, increased home value, improved ventilation and, of course, having an eco-friendly natural lighting source are just some of the reasons you may be considering have them installed. As a bonus, it is a relatively lower-cost upgrade than many other home improvement projects. Before you begin the process, it is helpful to do your research and understand the ins and outs of skylight installation. Depending on what type of skylight you get, you will likely discover through your research that installation can be a highly technical process. 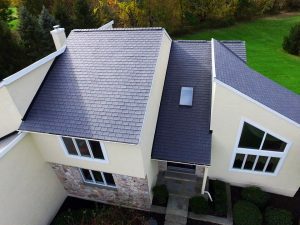 Some things that must be considered are optimal placement, its tilt and slope, potential water leaks, how home temperature will be affected and changes to the roofing that must be done to accommodate the addition. Even the most skilled hobbyist or amateur handyman may find the task to be a challenge. Even with the complexity of a skylight installation, in reality, the process can be broken down into three basic steps. After figuring out where you’d like to place your skylights, you can expect a hole to be cut, followed by attaching the skylight unit. The most challenging component for many is the final step which includes using paneling or drywall to create a light shaft. While the concept of skylight installation may seem like a deceivingly simple one, it is a job best left to professionals who are experts who are familiar with the process and can troubleshoot along the way if needed. Small miscalculations can equate to unexpected leaks and a home that does not properly utilize solar heat. In addition, because a faulty job can lead to mishaps such as damage or injuries, relying on a skilled person to install it can give you peace of mind that it will be done correctly and efficiently.